Pest description, damage, biology, and life history There are numerous aphid species on cottonwood. 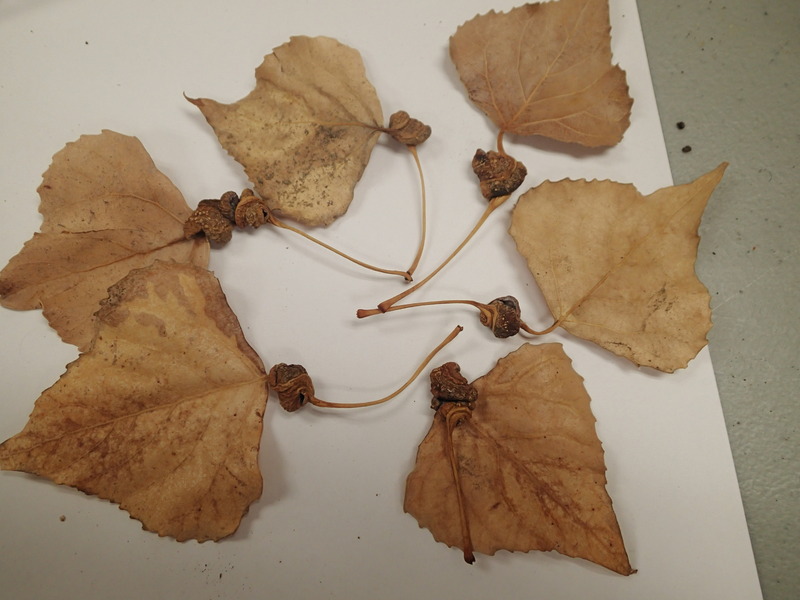 Some cause galls on the midrib or petiole, others feed on leaves. Some of the aphids have alternate hosts on crops such as lettuce or on weeds. Lettuce root aphids can be distinguished from other aphids by their short antennae (less than one-third body length) and undeveloped cornicles. Aphid-feeding on leaf petioles cause the petioles to enlarge and enclose the insects. Hard, pale green, rounded galls form along the petiole or at the base of the leaf. Aphids found inside the galls look grayish and waxy. The leaves are not damaged but may twist at right angles to the petiole. The aphid causes little damage to poplars but may be a serious pest on alternate hosts such as lettuce. Where lettuce or related weeds are not available, this aphid overwinters in the egg stage on the bark of Lombardy poplar. They develop into adults and reproduce once on poplar before migrating to summer hosts in the Brassica or Aster families. In late summer, winged forms reappear, and these migrate back to poplar to mate and lay eggs.